Our trading premises and personnel are available throughout the times stated below. Our store closes 15 minutes before closing time. Cash & Carry is defined as self-service and checkout in depot. The best price is offered in Cash & Carry. 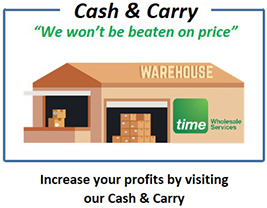 When you select Cash & Carry service online, you will be unable to process your order for Click & Collect or Delivery. A shopping list will be created for you to use in-store. For Click and Collect orders, an additional service charge is added to each case. This includes standard shelf price and all promotions. All Click and Collect orders placed before 2pm will be ready for collection the next day from 8am. 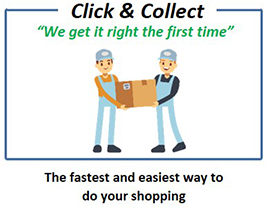 All Click and Collect orders placed after 2pm will be ready for collection the next day after 2pm. All Click and Collect orders placed after 7pm (outside trading hours) will be ready the following day. Please note, this is only for guidance and does not form part of any contractual commitment. Large orders over 500 mixed cases will require a minimum of 48 hours for processing. No charge is applied to tobacco products. The cash & carry price will be charged for collection. For collection orders, a minimum of 40 cases must be ordered. Tobacco does not form part of the minimum order. Please check your goods before you leave the premises. We will not honour any claims for shortages or damages thereafter. If you are collecting your order on a pallet, you are still responsible for checking the items before loading your vehicle. Please return your pallet on the next order. It is essential you check tobacco thoroughly. We will not honour any claims for shortages or damages thereafter. If you have an account – orders will only be released to the account holder for your own protection.If you wish to nominate another person to collect on your behalf, as protection to fraud, this will need to be prearranged and we will require photo ID (passport or driver licence). Your order will be available for collection for 3 days. We will contact you by phone as a reminder, after which your order will be cancelled and your account will be refunded. Please allow a further 7 days for credit to be issued. Cancelled orders which have been processed and waiting collection will be charged at £15. If you wish to cancel your order, please inform either by phone or email before we start processing your order. Our minimum order requirement is 80 cases excluding tobacco. If your order is below 80 cases and your delivery address is within the following postcodes: IG, RM, CM, SS, E, EC1, WC1, N1 or DA, an additional £35 delivery charge will be applied. If your delivery address is outside the stated postcodes an additional £45 charge will be applied. Any 6 single unit items purchased (Items which only contain one singular product) will be equivalent to 1 case. For example, 6 singles of spirit will equal 1 case. We deliver Monday to Friday. If you require your order on a Saturday, this can be arranged for an additional £20. Orders will be delivered to your store any time between 8am-5pm.As part of the service, you will be able track & trace the whereabouts of your delivery to get a live estimated time of arrival. If you require your delivery at a specific time an additional charge of £15 will be added. Orders placed on a Friday before 2pm will be delivered on the following Monday and orders placed on Saturday / Sunday will be delivered on the following Tuesday. No charge is applied to tobacco products. The cash & carry price will be charged for delivery. We do not collect cash on delivery. Payments must be made in advance of the order being dispatched via bank transfer, credit card or payment in store. Orders delivered by third party transport will be made to the kerbside nearest to your store. The transport company is not responsible for taking goods into your premises. If you have restricted access to your premises, please let us know in advance. For third party deliveries, your order will arrive on a pallet protected in black shrink. This will be further secured with a Time Wholesale security seal. If your pallet has been tampered, please report this to us whilst the driver is on site. You will be required to sign for your delivery. Please check your pallet whilst the driver is on site. We will not honour any claims for shortages or damages thereafter. If you have a damaged or a missing item or product you did not order, please call us immediately on 0208 595 7830. Any disputed items must be reported at the point of delivery and be clearly marked on the delivery note and countersigned by the driver. To return an item, you must call the helpdesk on 0208 595 7830 within 24 hours. If you wish to return an item, you have the option of returning it to us in-store or we will arrange for a collection. Please note, you will not be able to return items at the point of delivery unless you have arranged it with us first. If you would like us to collect the product sooner, we will have this arranged for you but a minimum flat rate pallet charge will apply. Call our helpdesk on 0208 595 7830. All products must be in their original condition and not be tampered when returning. We will not accept open packaging, products due to expire or goods in poor condition. See Terms and conditions. We do not accept returns for any medical product. We will be regularly updating the status of your order. Order received means your order has been received and acknowledged. You can still apply changes to your order or cancel the order at no extra charge. Order processing means your order could be at any point between being prepared in depot or in storage waiting to be despatched. If you cancel your order, a charge of £15 will apply. Despatched means your order has left our depot. Completed means your order has been delivered and signed by you. Cancelled means your order has been cancelled either by you or Time Wholesale Services Ltd.
We will send you an 11 digit tracking ID by text once your order has been despatched. 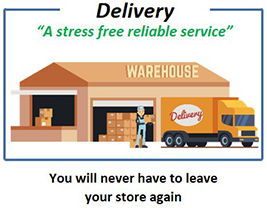 Once you have received this number, you will also receive the following link:https://track2.palletways.com Enter your 11 digit tracking ID here to trace the live status of your delivery. To cancel an order, you must call the helpdesk on 0208 595 7830. If the status of your order is order received, cancellation can be authorized at no extra charge. Cancellation will be unavailable if the status of your order is order processing. To cancel your order, a £15 charge will be applied. We are able to deliver goods throughout the world. Please contact us directly to make arrangements. To pay by cash –We accept cash in-store only. We are registered as a High Value Trader and do not accept cash over £9,000 in store without ID. If you wish to pay over this amount in cash, we will require your passport or your driver's licence. Please inform us prior to your visit so we can make the necessary arrangements. To pay by Card – we accept all major credit cards except American Express in-store, on-line and at the point of delivery for local delivered customers. Online payments are processed by SagePay. We use a 3D security protocol designed to ensure enhanced security and strong authentication when you use your debit or credit cards for online purchases. To pay by Credit - We will give you a credit facility to help support your business's cash flow requirements so that you have the ability to purchase for your customer's needs as they develop. You will always have funds available to make the larger purchases as your sales grow. When you are approved for a credit facility with us you will see a 'Step change' increase in cash flow and you will have access to funds to expand your business. Same day credit feedback – complete your application form by 2pm for same day feedback. Credit applications received after 2pm will be reviewed by 12pm next day. All credit payments will be collected by direct debit. Please note that the direct debit will take place on the invoice due date. An email of "Advanced Notification of a Direct Debit Collection" will be sent prior to collection. Your payment will be deducted from your bank account within 2 working days. If you choose to clear the payment in-store before the due date, the direct debit will not be taken from your account. Please note, all our debts are underwritten by a third party insurance company. Credit discretion is only rewarded by our underwriters. Terms and conditions apply to credit accounts. Personal guarantee will be required. If the direct debit is returned or unpaid, you will be charged £35.00 plus VAT on your account for administration. If you are unhappy with your purchase please call us on 0208 595 7830. We are here to help. Damaged goods will only be credited once they arrive back to our depot. Please allow 24 hours for credit to be approved. If you have a faulty product, please return the product back to us. We will send it to our supplier. Once we receive a credit for the faulty product, we will credit your account. Please allow up to 90 days. We do not refund short dated items. We do not operate a sale or return policy. Please see terms and conditions. Where a product has been specially ordered by you, unless faulty, we are unable to refund or offer an exchange. We are unable to accept cancellations for these orders. We will remind you before placing a special order.